Pet First Aid Month-Get Your Kits Ready! April is Pet First Aid Month and it’s the perfect time to get your first aid kits prepared. With Summer quickly approaching and the travel season shifting into high-gear, you never know what sort of medical attention might be needed for your four legged family member. By far the most common reason that pets pay a visit to the emergency room are for gastrointestinal issues, or rather, diarrhea and vomiting. In the moment it can be difficult to decipher if it’s truly gastrointestinal issues or if your dog ate something they shouldn’t have eaten, which could lead to an obstruction of the intestines or some type of poisoning. Other reasons for emergency room visits include trauma (hurt while playing or injured by a vehicle), painful red eyes, difficulty breathing, lameness and difficulty while urinating. 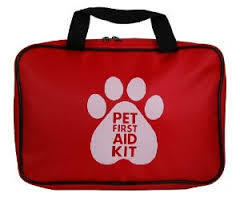 Instead of building your own pet first aid kit, some people opt to get one that is ready-made for them. Amazon is a good place to start your search. Be advised that not all of them will come with the list we have here, so you may have to add some items to it. Along with your first aid kit, you’ll want to have some important phone numbers handy. Such as your primary veterinarian, emergency clinic and the animal poison control center (888-426-4435). For more information on what to include in your Pet First Aid Kit, visit The Humane Society of The United States. ← He Was Lost For A Week, But His Bark Led Rescuers To A Storm Drain?